Starting a dog treat business is a fun way to bring ijn extra income. Businesses that focus on pets continue to multiply and grow even in times of recession. People do love their pets. One theory is that pets are replacing children who have grown up and left home, and another theory is that pets are becoming companions for more and more people who are living alone. There are others, but the bottom line is that new businesses pop up constantly and have customers. 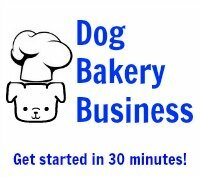 There are a lot of small businesses selling dog treats being run out of a home as well as more and more dog bakeries employing professional cake decorators and bakers. If you are interested in working from home, just make sure you know what the regulations are for edible dog products in your geographic region. One perk about having a bona fide business is that you can get wholesale pricing on certain items from companies offering wholesale accounts. Wholesale pricing provides a discount because more product is purchased. If you just like to bake, or want a kids craft project, school events, fundraisers, charities and non-profit organizations may be interested in your creations. Homemade dog treats are fun to make even if you are not in business. Follow K9Cakery on Facebook and "meet" new businesses dedicated to making dog treats, dog bakeries, and individuals making homemade dog treats. Our Facebook "friends" are always posting photos of their finished products which are amazing. There are other ways to get into the dog treat business besides actually making dog treats. K9Cakery has an affiliate program. What this means is you can send buying customers to the website through a link from your website, and then you receive a commission on their purchase. All you have to do is let them know the benefits of the products. You develop the customer relationships. The customers click a special individualized link from your website to K9Cakery, and you receive your affiliate commission. You do not have to carry inventory, or fulfill orders. That is one of the wonderful advantages of affiliate programs. Take a look at some of the popular products featured in the right column. Do you know others who love to bake? Write about baking for dogs, post photos of your own dog treats, and cultivate your audience through the various social media outlets. People love their pets and often will go out of their way to bake treats more than they would for other humans! The affiliate program gives you products to sell without having to invest time, energy and money to create your own. So, think about starting a dog treat business by becoming an affiliate today. 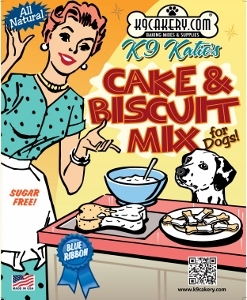 Click here to learn more about becoming a K9Cakery affiliate.